'51 Studebaker Commander Starlight Coupe - The "Chicken Hawk"
1951 Studebaker Commander Starlight Coupe. 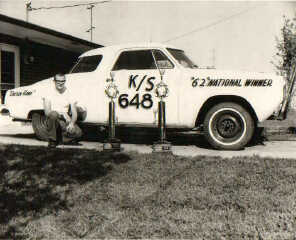 Back in 1962 we entered it in the NHRA National Drags in stock class and won the class. In 11 years we won the class 8 times. 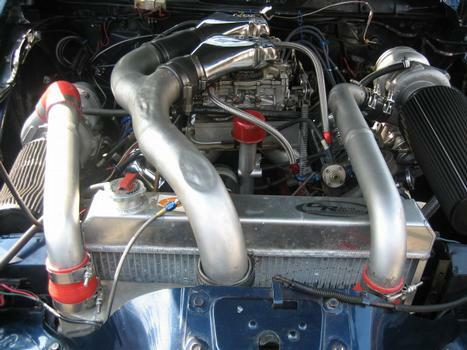 Now running a Studebaker 289 with twin turbos. 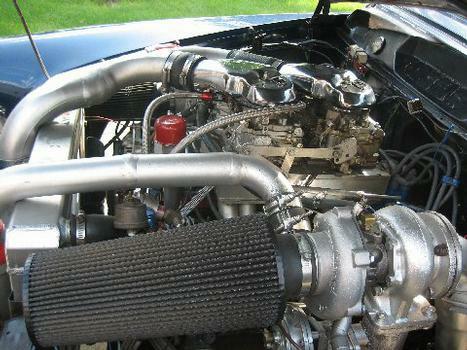 As seen in the August 2006 issue of Hot Rod magazine. You can read the article here. Ted is a true gentleman racer and was recently inducted into the NHRA Hall of Fame!! He is just to modest to mention that! 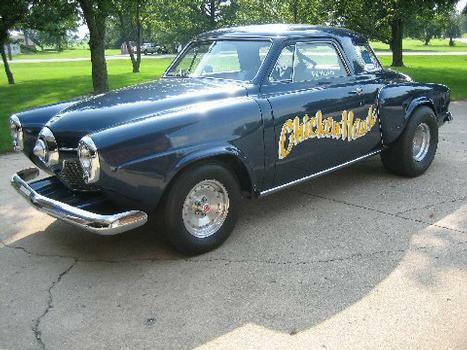 A cool Studebaker, and a great driver, that will be in the 9's soon! I met Ted Harbit in the pits at Indianapolis Raceway Park at The NHRA National Drags in 1962, when I was 16 years old and he was 27...as he is in the "old-timey" photo above when the Chicken Hawk was light beige. It's been my privilege to have known him 46 continuous years; a finer gentleman and fellow Studebaker enthusiast you'll never find. I was there this weekend and watched the wreck and took one of the employees down there as it happened. Ted was moving then. He has several broken bones a collapsed lung, and a few other things. They put all classes on the 1/8th because of the wind so he wasn't going as fast but he was still around 100mph. I park down near the end of the track and my dad was at our trailer and he said he saw Ted and the car 10 feet in the air. Ted is a TRUE gentleman and a very nice man to talk to. When I was young I remember that car when we would go out and watch. He has always hauled the cars out on an old Studebaker truck as well. He will be in Ball Memorial Hospital here in Muncie for at least a week but is stable and in good spirits. Such a famous car and driver...hate to see it happen. That is why we have the new diaper rule at Muncie. I ordered mine this week. Very scary crash to watch and LUCKILY he hit a sign board...I say luckily because he would have kept flipping and ended up on top of some cars/trailers in the pits. That also helped him right side up. For about an hour people couldn't find words and I couldn't either. It was a beautiful car and a comment saying it doesn't look that good since he wrecked it is very foul and rude. You watch a 74 year old man hit a rail and keep flying in a famous car. That was off color. The car is toasted though which is expected. Very sad to see. NOT only because of the car but because of the gentleman Ted is and that kind of a crash only shows the quality and need for safety equipment. I will give Muncie props for the tech inspection now. With the former owner, we weren't checked closely, if at all. Our thoughts and prayers go with that man and his family...and as a side note..to a testament of the man he is. He told people not to call his wife, he would when he got to the hospital because she would worry too much. He is the type who was always there to help others and was NOT self centered at all. Even after the history the car and himself have made since the 60s. You would never know talking to him. I too was there. It was by far, one of the more scary moments I have witnessed at Muncie Dragway. I have had the honor of talking to Ted at several events and he is one of the nicest guys you would ever want to meet. He was very passionate about ChickenHawk and racing. You could see it when he would talk to you about the car. My dad passed away in a car accident in 94 and Ted and ChickenHawk were a big reason my dad went to the drags. Maverat, Hoosier Hurricane, HiHo Silver, and "ChickenHawk". Had those cars not been there, we probably would have not went. Me and my brother weren't allowed to talk when those cars were running. Now that I'm older and have more passion for cars, I understand what its like to love a car. I know Ted really loved his car. I too am very saddened to see the end of a 47 year tenure of a car that not too many people wanted to line up against. Very sad. i raced vs Mr Harbit @ muncie many times when i was a kid. I was a hot dog in a c/sa 63 dodge & got many a driving lesson from him & that damd studebaker. but, i learned.. and learned, & finally beat him, and never looked back. we talked alot, but were never really friends, i guess.. but, i feel like a brother has been tripped up when i look back @ the pix. when i heard about Mr. Harbits accident, i was broken hearted. Still am. Sad ending to a wonderful legacy by a tuff to beat car & driver combination. 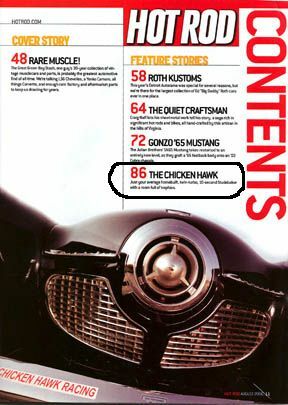 I have to say that I was very saddened when I saw the photo of the totally destroyed Chicken Hawk in Hot Rod Magazine. I'm very glad that Ted is OK. I became a huge fan when I read the article on Ted and the Chicken Hawk in Hod Rod a few years ago - I saved the issue just because of it. Ted is a real hot rodder who raced the cars he loved ( Studebakers ) and never gave in and switched to another make because of convenience. I really admire that and I hope he continues racing and "playing" with Studebakers. I always wished that one day I might get to meet Ted and get a close look at the Chicken Hawk. In my book Ted and the Chicken Hawk have reached legendary status. I grew up living next door to Ted's friend "Frantic Fred" Robinson.Fred also had a 51 Studebaker at the time. As a child I dreamed of owning a 51 Stude myself. ( I still do.) I have followed Ted's adventures with the "Chicken Hawk", the 64 Lark and Avanti. I know Ted will miss the 51 dearly. Like others, I first read about ChickenHawk in Hot Rod a few years ago. I immediately loved the car and admired Ted's dedication and love for it as well. I wish him a speedy recovery and offer my condolences on the loss of an awesome rod he's had since 1961.